when is the next LWPS? It will held roughly what time on weekends? Is this heads up tourny going to be available for this up-coming LWPS? Sounds very interesting. 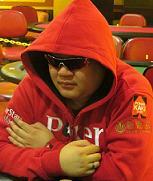 I can help you gather few players for this heads-up if not enough players. Can explore this format in the LWPS championship. Wsop h-u championship format which allows each player to use two add-ons at any point during the match: For eg, players have the option of starting with 4000 (with 2 add-ons in reserve), 8000 (with 1 add-on in reserve), or 12000 chips (with 0 add-ons in reserve). Addons was used in this year's WSOP for heads up I think. Definitely reduces the variance as people can survive cooler situations. What about satellites to enter this HU tourny? Is that possible? Why didnt this tourney format materialize? Would be fun! Pls PM your contact to 8ivan8 if you are keen. Pls leave a msg in this link mentioned below as well. will be played during lwps right? Er... yes it will be played during LWPS... but it is almost a year ago.. and already had the tourney... maybe another one coming soon?